I think I found one of the best mix of flavours for my bacon with this recipe. In addition to using the standard cure, I added maple syrup, juniper berry and nutmeg (details below). 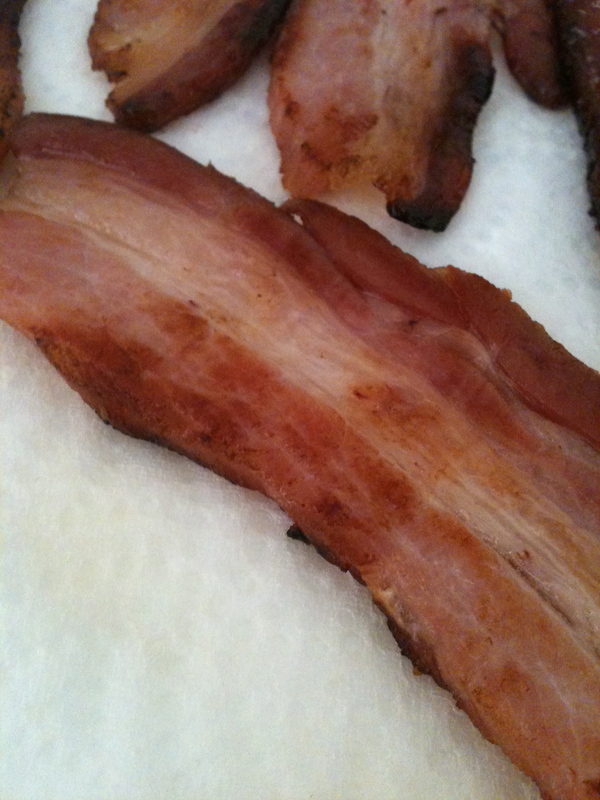 The bacon below was slow cooked in a pan before resting on some paper towel. For the pork belly, leave the skin on. I always get a 1.5-2 kg (3-4 lb) piece. In addition to the basic cure, which I add 20 g per kg (9-10 g per lb), add 0.5 cup maple syrup, 1/4 cup juniper berries crushed slightly, and 1 whole nutmeg ground (about 2 tsp). Mix all the cure ingredients and mix with the belly in a non-reactive container (I use zip bags), and let sit in the fridge for 1-2 weeks, depending on the size and thickness of the belly (the belly will become firm to the touch when ready). Wash the belly, dry with a towel, and roast in the oven at 95 C (200 F) for about 1.5 h, until the internal temperature of the belly reaches 68 C (155 F). The same can be achieved with a smoker (but I don’t have one, yet). Remove from the oven, let cool, remove the skin, and store the bacon for up to 7-10 days in the fridge.